Dropped kerbs (sometimes known as footway crossings or vehicle crossovers) allow you to drive a vehicle from the street over the footway onto your driveway. To do this, the kerb is dropped from the normal height and the path is strengthened to take the weight of the vehicle. Without this, the path and any pipes that are buried below it could be damaged. If you drive over the footway but do not have dropped kerb, you are breaking the law and enforcement action could be taken against you. 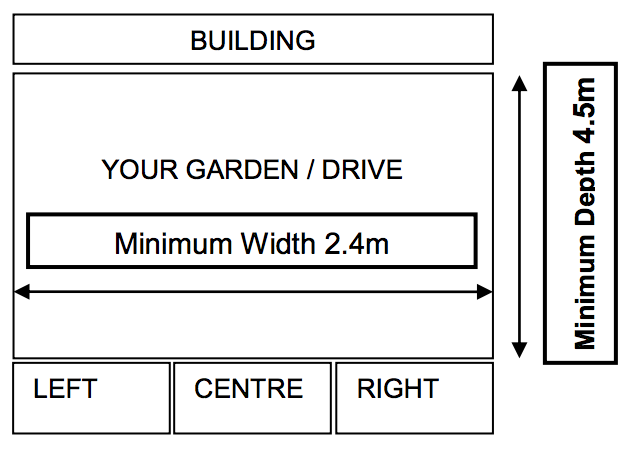 Straight parking - this diagram is based on a property that does not have a bay window. If you have a bay window or porch you must have 4.5 metres from the bay or porch if it is in the parking area. Alternative dimensions will only be considered for angled parking and then the minimum depth is 3.8 metres. There is a non-refundable application fee of £164, which must be paid before your application is complete. Make sure you have read the approval criteria before paying your application fee. To apply, you must be signed in to your My Account. If you don’t have one, you can create a My Account. If your application is successful you must pay the full fee before your dropped kerb installation can start. You can use your credit or debit card to pay by calling us between 9am and 6pm. When prompted, state dropped kerb. You will be connected to a member of staff who will take your payment details. Call us on 020 8215 3000. You can pay in person by using the Scan Coin facility at Dagenham Library. Paying in instalments will incur additional fees. You must complete the dropped kerb application form and pay the initial payment of £185 for dropped kerbs under £1,000 and £285 for dropped kerbs over £1,000. The minimum qualifying value for instalments is £500. Instalments can be spread over either a 6 or 12 months, payable by Direct Debit. The first instalment will be due 21 days after the invoice for the service is issued and monthly thereafter. The payments will be collected via Direct Debit. Our finance department will contact you to set up the Direct Debit. If an instalment is missed, the entire payment plan will be cancelled and the amount outstanding will be due immediately. Each payment plan will be charged an administration fee of £35. All payment plans will be subject to a 6.5% finance charge on the overall cost of the dropped kerb. The charge reflects our costs incurred by offering payment plans. This charge will be spread over the payment plan. Ensure you pay the correct initial payment fee as failure to do so will result in a delay in setting up your instalment plan. From the list of payment options, select Payments by Instalments, then Dropped Kerbs. Once you've paid the upfront payment online, complete our set up form to set up an instalment payment plan, and email it to the address on the form. This part of the process usually takes around 5 weeks. You will receive an invoice and instructions on how to setup a direct debit with your bank. Once this is setup and the first payment has been made, we will progress your application and raise a work order to the contractor depending on whether your hardstanding is complete, there are no obstructions such as fences, walls, lamp columns and trees and have received approval if it’s a council property. This form is only to be used if you have received a letter from us offering a reduced rate. To be eligible for a dropped kerb grant you must be over the age of 18 and have substantial difficulty in your mobility. You must have an appropriate hard standing (driveway) in place on your property as the grant will only cover the cost of a dropped kerb. Residents can apply for a white access T-bar to be painted on the road across the extent of a dropped kerb to highlight the area of the vehicle crossing and deter inconsiderate parking. Access T-bars will only be installed in streets where there are no parking bays or restrictions. The cost of providing a 'T' bar marking is £356. This fee covers the cost of arrangement and for a contractor to carry out the work. White line markings adjacent to your dropped kerb are advisory, but where a vehicle parks across a dropped kerb without the permission of the property owner/occupier, a penalty charge notice can be issued if the vehicle is preventing entry to or exit from your driveway. We can only enforce this offence after a complaint has been received, as you can give someone permission to park across your dropped kerb, so we need to know if someone is parked there without your consent. The above does not apply to dropped kerbs adjacent to yellow line markings or zigzags, as these restrictions are always in force.. It is an offence under Section 184 of the Highways Act 1980 to drive a vehicle across the kerb and pavement to gain access to a property if a properly constructed dropped kerb is not in place. You can report illegal front garden parking online and you need to be signed in to your My Account to do so. If you don’t have one, you can create a My Account. Use our form to report a vehicle overhanging a driveway on to a pavement or a road.